Merri Travels on Endurance.net: Cat! 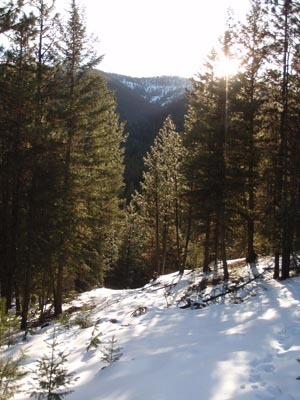 I wander up a hill in this Montana forest, savoring the winter snow. The snow is heavy and wet, dragging at my feet. 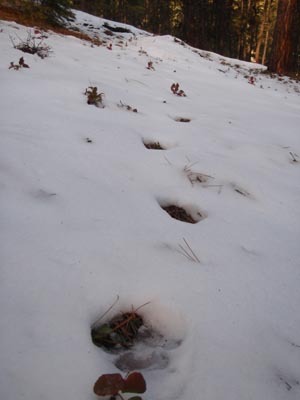 Deer tracks litter the snow, telling the story of a busy forest over a highway that's hidden in the summer. Without snow, the forest always looks empty. It's not. I clumsily slop and slosh and half slide along deer highways and down a snow covered logging road - until I stop dead in my own tracks. 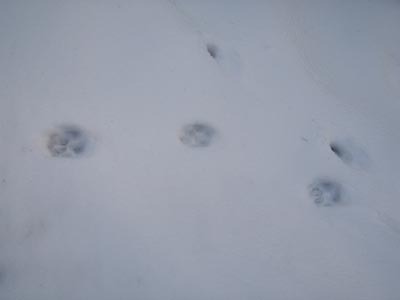 Small, but unmistakably (I'm hoping - I'm pretty sure) cat tracks. 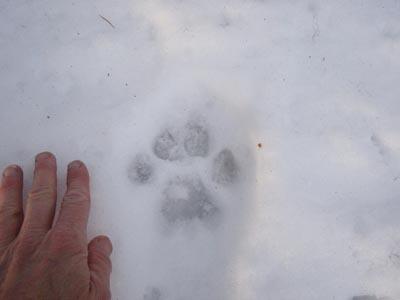 Has to be a bobcat. The tracks cross this logging road and go straight up the hill. 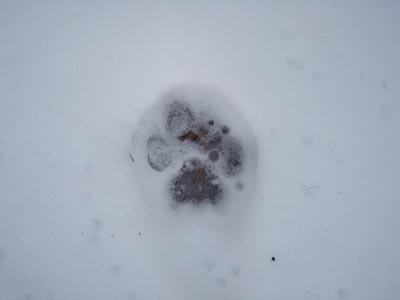 The cat is long gone, but of course I have to follow. Up I scramble, slipping, falling, slithering, panting, grabbing onto roots and brush to keep from sliding back down; ridiculously, maddeningly graceless as I follow pawprints of an undoubtedly graceful, efficient, effortless cat. I can't read snow as well as dirt, but with the softened, sunken print in this softened, gently melting snow, I'd say the tracks came from the night before. 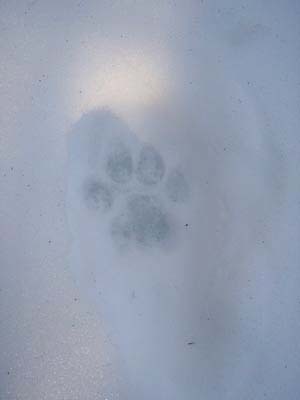 The cat was on a mission, tracks undeviating, heading straight up the mountainside. 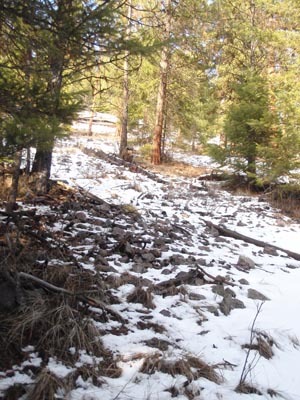 On a southern facing slope with sparse trees, the snow disappears, and with it, the tracks and any hint that anything passed this way. 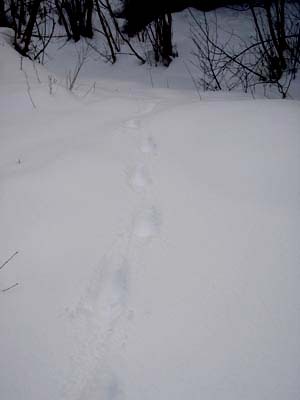 I slide back down the hill (actually sit on my coat and slide down) and follow the tracks where they came from. Still a straight line - across the road back into the forest, over the snow-covered little creek (water flowing beneath, snow thick enough that I don't fall in), until the tracks finally fade in ice. 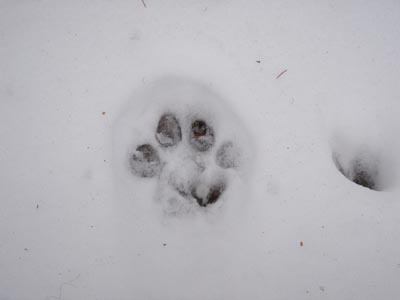 The snow will melt, the tracks will disappear. But the cat will still be here... somewhere.